Top quality performance quarter horses for sale at our farm outside Louisville,Kentucky. 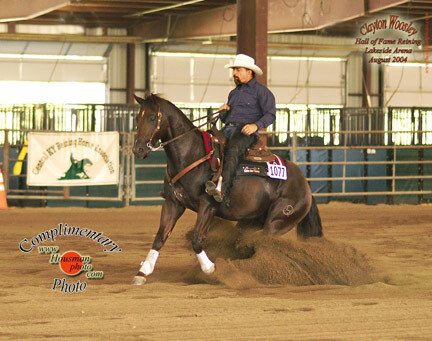 We specialize in performance pedigrees for reining, cutting and great all around riding horses. We are breeders who care about quality, integrity and service in dealing with our clients. It is our intention to become one of the premier quarter horse breeders in Kentucky and indeed, the country. Home of stallion Hotrod Doc Olena. In addition, in our online shop, we offer tack, supplies and equine related books at some of the best prices on the web. Free classified ads. We also offer free horse training tips, care tips and review products that we use around our farm. New articles are posted regularly. In addition, we design and host websites at very competitive prices. Please look around our site and add it to your bookmarks/favorites as we frequently add new items and update our pages. And don't forget to sign up for our newsletter so that we can let you know when we post new horse training articles, horses for sale or super specials from our online shop. We welcome your comments and questions so please do not hesitate to send us an email or give us a call if we may be of assistance. SPAMMER WARNING: Since I put an ad on www.thereiner.eu I keep getting spam emails from them even though I've told them to stop. So, you use their site at your own risk. I am concerned that they will sell the email addresses to other spammers as well. Like there is not enough crap in the inbox. I recommend avoiding this site if you value your inbox. Be among the first to recieve new tips and specials. 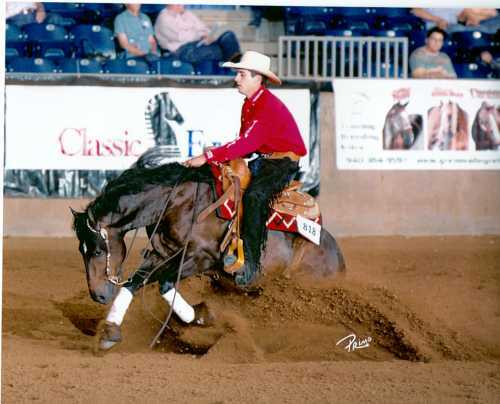 He is currently continuing his training and showing in NRHA/AQHA reining. He is a great riding horse (John's favorite) and we will keep him here at Hideaway. Click here to see more pictures and video of Hotrod. Hotrod's first foals has arrived. A beautiful chestnut colt out of a daughter of Nu Chex To Cash and a gorgeous buckskin colt out of a Poco Bueno/Te N Te mare. See them on our sale page. Foundation quarter horse stallion Smokem Ifya Gottem, is registered with AQHA - FQHR - NFQHA - FSHR. Foals are eligible for AQHA Incentive Fund and Kentucky Quarter Horse Breeders Association Futurity. His bloodlines include Leo, Poco Bueno, Paul A, and Oklahoma Star which show conformation, speed and cow sense to produce great looking, versatile horses with superior disposition. SOLD Moved to Virginia. See his page for more info about Smokem and his new owners. All are FREE. Browse the classifieds for that horse you are looking for or post an ad on a wide variety of horse and equine related topics. Start or join a conversation on our equine message boards. Just click here or on the links to the left. We hope you find our site a useful and fun place to visit. Check out these great saddles that are customized for you and made right here in the USA. Free shipping for a limited time. Click here now for On-line Discount EquineStore. BIG DISCOUNTS on tack, books (Large John Lyons collection. ), supplies, and other products. Our items are all personally selected for you to ensure value and quality. 100% SECURE on-line transactions. Slidem.com is for the performance horse enthusiast. More training tips, articles, classifieds, and polls/surveys along with it's own on line shop. THANK YOU FOR VISITING HIDEAWAY QUARTER HORSES. Please bookmark our equine site and visit us often. If you have comments or suggestions, have a training question or just want to say hello, send us an email. We would love to hear from you.